When pondering an escape from the ivory tower, you probably think about becoming a lecturer or a classroom teacher. This reaction is natural since teaching is a valuable, concrete skill. You might even be able to make good part-time money at it if you get a job teaching the SAT or the LSAT. But don’t make the leap just yet, especially if you want to leave academia because you had trouble managing your classroom time. Kerry Ann Rockquemore describes the impact of the “Teaching Trap” over at insidehighered.com, and it’s clear that teaching is one of the classic tasks that expands to fill the time available. Limit the amount of time you grade each paper. You should know after reading two paragraphs whether or not a paper is worth your time. If you read a stack of papers that all start off badly, you’re better off devoting a class to good introductions and thesis statements instead of painstakingly grading each paper. You can’t help them if they don’t want help. By no means am I advocating leaving students behind, but the comments you leave on papers will not inspire students. What you do in the classroom is what counts. If you think a student can do better with a little more effort and a brief one-on-one session, write a note on the paper telling the student to attend your office hours or to visit the campus writing center. Print out papers with the address of the center and other related information to save even more time. Cut students off if they want you to write their papers. Some students are smarter than you give them credit for. They go to your office hours to find out what you want in a paper, and they’ll repeat it back to you. This is great for the student but bad for you because this game takes up a lot of time. When a student is trying to squeeze you for ideas, hold your ground and tell them to go back over their classroom notes. 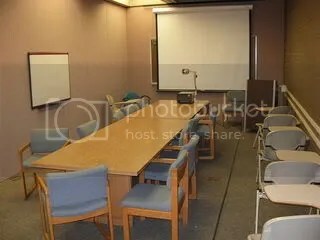 Image of a classroom at the University of Pittsburgh by Piotrus from Wikimedia Commons under a Creative Commons license. Subscribe to comments with RSS	or TrackBack to 'Tame the Teaching Workload First'. I agree whole-heartedly with your comment about teaching filling all the time available. There is of course much to love about teaching, and so many reasons to go into it, but those about to do so need to recognise that it isn’t a 9 to 3 job for perhaps 40 weeks of the year. Absolutely. I think people watch movie depictions of slacker high-school teachers (Bueller? Bueller?) and assume teaching is a relatively cushy gig. And then they realize how much work must take place outside the classroom!